Fun Zoo (Odyssey, 1972): "Fun Caged Beasts" just wasn't a catchy enough title. Fun Zoo is one of the six "extra" Odyssey games released in 1972. You could get them in a box of six or buy them separately. The first one we look at is a title aimed at children along the lines of the game Simon Says. Rather than write about it the same way I wrote about Simon Says, I ran with the concept that the name "Fun Zoo" reminded me of Sun Tzu. Fun "Tzu" is an enjoyable game aimed at younger players to help them identify the written names of animals with their illustrations, improve hand-eye coordination through the use of Odyssey's controllers and employ morale crushing stratagems designed to annhilate the enemy's will to wage war. The idea here is to set the Target Spot oscillating across the screen and behind a row of targets on the overlay (plane, rabbit, duck or ship. ) Shoot it as many times as you can letting it go back and forth ten times before moving it down to the next target set. Player Two acts as an assistant, doing the manipulations of the controllers as well as keeping track of the oscillations. Player One does the shootin'. Dogfight! (Odyssey, 1972): It’s not actually about dogs fighting!? Sheesh, are the dogs flying the plane, then?Dogfight! is similar to Submarine: one player takes on the role of a vehicle operator trying to pilot their way through a winding path on the screen. The second player tries to shoot the PlayerSpot representing the vehicle. The big difference between this game and Submarine is, of course, Odyssey’s light-gun rifle add-on -- oh, and this time it’s a plane instead of a convoy of ships. Similar to Shootout! one player pilots the plane through the winding path while the other player tries to shoot the plane using the light-gun. The players keep track of the number of hits and then switch places. The player who scores the most hits, wins. 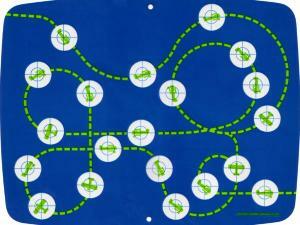 The “plane” must follow the specific path shown by the green dotted line, starting in the top left and exiting on the bottom right. The light-gun can only hit the plane while it’s in the circular area containing the targeting reticule. This isn’t a “rule” it’s just an impossibility. Like our friend the flying lizard in Prehistoric Safari, the screen doesn’t let through enough light through the green dotted line for the light-gun to detect. Shootout (Odyssey, 1972) overlay: Dusty little town. Quiet little life. Suddenly: BLAM! BLAM! BLAM! Shootout! (Exclamation point foreshadowing trend of very excited games on consoles with "Odyssey" as part of the name.) involves moving your Outlaw Gang (little white square) from window to window without getting shot by the gun-wielding Sheriff. 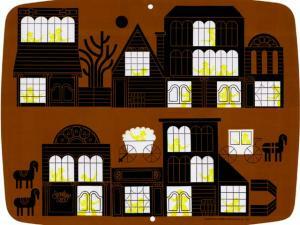 Your Outlaws start at the upper left and move to the upper right, obliged to light each window along the way. As though a single organism, they then cross the street to the "low side" of the screen using the stagecoach as cover, then they make their way to the lower left corner where "escape" horses await. This all takes place while your friend, parent, spouse, offspring or other loved one tries to shoot your Outlaws, and, symbolically, you! As you sneak from window to window, you can't just zip through the window at a blinding speed. Your Outlaw Gang has to stop in each window long enough for you to yell: "You'll never get me, Sheriff!" When we play, this phrase invariably corrupts into being pronounced "yoollne'ergitmesherff!" as we, understandably, attempt to say it as quickly as possible. Well, sorry it's been so long since my last entry but I've been trying to come up with a way to convey the look and feel of Odyssey games without getting even more verbose than I already am. Solution!--YouTube and a new camera that actually records sound! This should help everyone understand the mechanics of Odyssey's lightgun game, Prehistoric Safari.